Sandra Hogan-LaMarche is a professional artist Inspired at an early age, Sandra won her first art competition at the age of eight! Her most intense and memorable artistic experiences came while she attended Notre Dame High School in Belmont, California. There an elderly nun instilled in Sandra a strong respect for the old masters. By closely studying the masters’ techniques, brush strokes and use of colors, Sandra quickly became adept at mimicking their styles, a skill which continues to serve her well. This is also where Sandra's love for the diversity of art forms was born. She later completed her BA in Art and Commercial Graphic Art at the University of California, San Jose. Sandra drew heavily on her fine art talent and training during her early career as a graphic artist, designer and illustrator, enjoying putting on many hats; creating particular styles of art for her clients by request and transforming them into major campaigns by design. Sandra decided to devote more time to fine art just a few years ago, and still continues to paint mostly for pure pleasure these days and and when commissioned. Today, she is building her own bridge to the 21st century as she uses her artistic talents and skills to design Internet Worldwide Web Sites in conjunction with the corporate identity materials necessary in reflecting the sophistication and style of the clients' products or services. 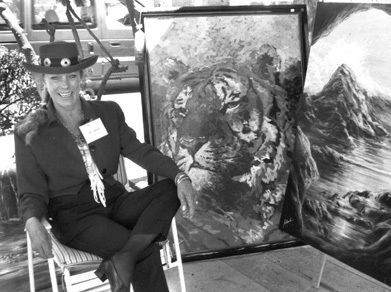 Throughout her career, Sandra won countless awards for concepts, designs and artistic development of various projects; among these are the “Hall of Honor” award presented by the International Association of Fairs and Expositions for the best overall program of any fair in North America. Born in San Francisco one Valentine's Day long ago, she is the mother of two sons, Tim and Tom Hogan, and an extremely proud grandmother of two handsome boys, Ryan and Christian Hogan. And in 2013...Onward and Upward. ...Life is SO much kinder these days.